“The Development of Sewage Treatment” CPD seminar was successfully conducted at PAM Sabah Chapter last Saturday (21st June 2014) by Tomher Environmental Sdn Bhd Technical Sales Director, Dr. Frank Wilson. The topic was presented in a historical way following the evolution of sewage treatment from the UK industrial revolution in the 19th century to our present day in Sabah. 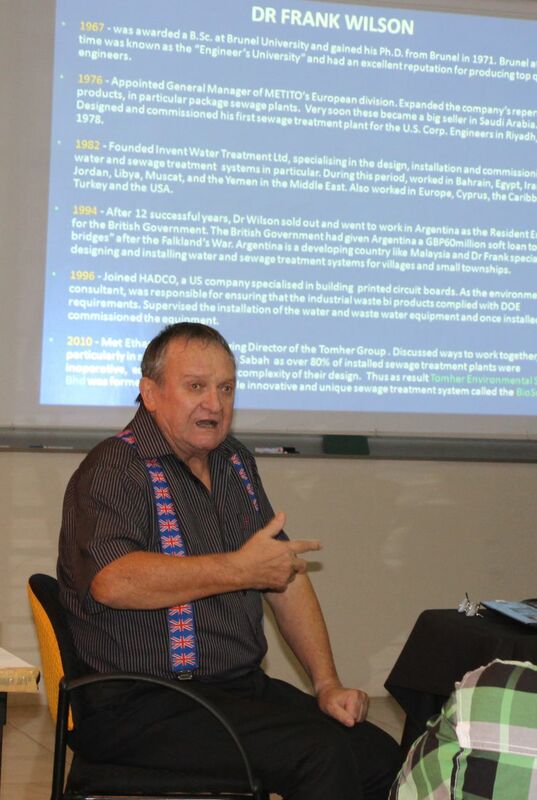 His anecdotes from his broad and long experience in sewage treatment around the world were the highlight of this workshop. Dr. Wilson’s autobiographical involvement in the sewerage business. History about sewerage treatment in general both globally and locally. Explanations of other forms of treatment like cesspits, septic tanks and reed beds. Issue of water pollution, eutrophication, FOG (fats, oil and grease), E coli and how dangerous it is to swim at Tanjung Aru beach! Details on activated sludge treatment, micro-organism growth curves, sewage screening, trickling filters, rotating biological contractors, trickling filters solids contact, tilted tube/plate clarifiers, v-notch weirs, final treated water standards and dried sludge, sludge presses, hydroponics, pipe trenches, safety hoops and safety rails, extended aeration, Biosolv advanced sewage treatment and many more. Some example projects done by Tomher Environmental Sdn Bhd. There were 42 attendees consisting professional architects and architectural graduates at this event. The workshop started at 9.15 am and end at 11.30 am with tea break provided in the middle.